"This dense chocolate treat is a chocoholics dream!" 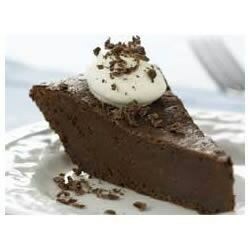 Preheat oven to 325 degrees F. Grate 1 square of the chocolate; set aside. Place remaining 10 chocolate squares in large microwaveable bowl. Add cream. Microwave on HIGH 2 min. or until chocolate is almost melted. Stir until chocolate is completely melted; cool slightly. Add eggs, sugar and flour; beat with wire whisk until well blended. Pour into lightly greased 9-inch pie plate. Bake 35 min. or until outer half of pie is puffed and center is slightly soft; cool. Top each slice with a dollop of whipped topping just before serving. Sprinkle evenly with the grated chocolate. very good. added crumbled chocolate cookie pie crust. does not need the full cooking time, just w few minutes less to make it more moist. One review used an oreo crust so I did that too. I also used chocolate chips instead of squares, and baked for 30 mins. Rich and yummy. Will definitely be making this again. I have made this a few times and we love it. You don't need a large piece, a little goes along way. Topped with real whipped cream lightly sweetened. Can't ask for an easier dessert.